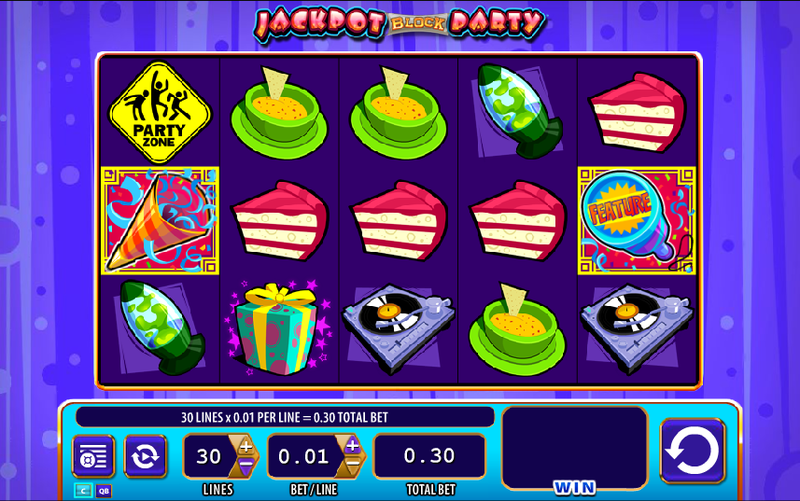 Learn the ins and outs of Jackpot Block Party slot game! The themes that come along with online slots games are almost always something to look forward to. Sometimes, players will find that they centre on references to popular culture, while other times, they will find that they focus on ideas that one would not ordinarily pair with an online slots game. However, when the latter occurs, players are often pleasantly surprised. This is certainly the case with Jackpot Block Party Slot game. Essentially, this theme is one that centres on the idea of a massive party and the reels are adorned with a fantastic array of party highlights. All in all, Jackpot Block Party Slot online game has a fairly simple structure to it. Much like most other slots games, it does not complicate the way in which its reels appear too much, as this will only make it difficult for players to truly be able to enjoy themselves. With five reels and 30 paylines, this game is small enough to not get players overwhelmed and big enough to ensure that they remain entertained throughout. The basic symbols on the reels include the likes of a bowl of chips and some dip, a piece of cake, a glitter ball, a spinning deck, a lava lamp and a sign declaring that the area is a Party Zone. Almost every good online slots game has a few bonus features tucked away here and there, and Jackpot Block Party slot is certainly no different. If a player manages to spin at least three wrapped present symbols, they will trigger the bonus round. Here, they will be allowed to pick one of the presents, which will reveal a cash prize. Of course, the value of this prize is determined by the specific box the players has selected. However, regardless of what the value of the wrapped present may be, a cash prize is always welcome. Jackpot Block Party slot game also boasts an extra game, which is bound to attract the attention of players. In order to trigger this game, players need to spin at least three scatter symbols, which are represented by party accessories. This will redirect players to another screen. Here, they simply need to select gifts in order to reveal even more prizes. Should a player stumble upon a plunger, they will be redirected into another room where they will be able to further increase their winnings by selecting more gifts. While Jackpot Block Party slot game may not necessarily have a theme that many would pair with an online slots game, Williams Interactive, the software developers that created it, have certainly found a way to make it work. With plenty of bonus features, free rounds and extra games on offer, this game has something for all players to enjoy. Furthermore, its simple structure means that it is ideal for every level of player, whether they may be beginners or seasoned players, to immediately participate in and enjoy without much hassle.